In the early days of World War II United States Marines used World War I-era bronze or alloy-handled knives, such as the standard Mark I trench knife. In this new war however, these old-fashioned knives were seen as unwieldy by soldiers, and were also expensive to manufacture. So throughout 1942 the War Department looked at many different submissions for a new combat knife, while many marines purchased their own knives from lack of an official standard. In November the Camillus Cutlery company submitted a knife for use. It was called the 1219C2, and the War Department chose it. By early 1943, four major knife manufacturers were producing what would soon be called the Mark 2 combat knife. One of these producers was the Union Cutlery Company out of Olean, New York. Their knives were stamped with the company's "KA-BAR" trademark on them, so-called because their knives could be used "to kill a bar", as one 1920s testimonial letter wrote. They eventually became so popular that they were all called KA-BAR knives by soldiers, no matter who actually produced them. It would eventually be adopted by all of the armed services, and Union Company re-named itself KA-BAR in 1952, as the knives were now highly popular. This useful knife has seen action in every major combat operation the US has take part in since, from Korea all the way to Afghanistan. It's also become popular with people that just want a useful knife. Truly this knife is a key part of American history. 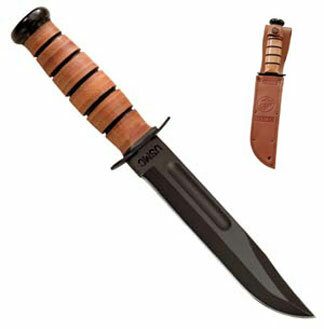 You can purchase your very own KA-BAR knife on our store!